Champion action pistol shooter Robert Vogel has recently hung out his shingle and started on the teaching circuit, offering anyone who wants to improve their skill with a pistol a great opportunity to look at the techniques and methodologies he’s used over the years to bring him an impressive accumulation of titles and championships. It doesn’t matter if you want to actually beat Mr. Vogel at the next world shoot or improve your ability to fire an accurate shot in self defense, there’s something here for you. Day one of training began with a safety brief covering the major rules of firearms safety. Mr. Vogel then transitioned into an explanation of the techniques he uses to get the results we see on the range. The lecture focused heavily on the grip he uses on the gun as a proper grip is the foundation of control when it comes to shooting a pistol. In my various experiences on the range I’ve found that most people don’t really understand the importance of their grip on the handgun, not only for control but also for proper function of the weapon. They often mimic the look of a grip used by top level shooters without really understanding what the shooters are actually doing with their hands when they are on the gun. This problem is compounded by a number of well-meaning but incorrect axioms about gripping the gun. Just the other day in a discussion about handgun accuracy on a forum I saw someone quote one of the worst offenders, the old 60/40 rule. You know the one, 60% of your grip pressure should come from the left hand, 40% from the right? Sound familiar? It‘s bunk. I’m sure the goal originally was to try and give a mental concept to new students unsure of how hard they should be gripping the gun and it made sense in that context…but it has since become divorced from that limited application and turned into a law people parrot without understanding. The bottom line on the pressure you should use in your grip is this: You want to grip the gun as hard as you can, but not too hard. This is something of an amorphous concept for a new student and so various rhetorical tricks have been used to try and communicate the kinesthetic concept to the uninitiated mind. If you grip the gun as hard as you can, with every bit of strength you possess, you will see the gun shake violently. Obviously this is no good. Grip the gun as hard as you can and slowly back the pressure you’re using off until the gun is no longer shaking violently. That’s the amount of force you want to exert on the gun. The reason instructors often use percentages when describing grip pressure is to try and get students to grip firmly, but not so firmly that they’re shaking the gun. What students often don’t understand is that when an instructor says “I’m only using 60/70/80% of my grip strength”, in reality they’re doing exactly what I described: gripping as hard as they can without the violent shake. Often someone who is teaching firearms has developed significantly higher levels of grip strength than your typical student and so while the instructor may be using “80%” of his grip strength on the gun, if we measured it objectively with instruments we might well find that he’s applying more than double the amount of force to the pistol as the student receiving the instruction. The students often misread this as a limit on how much force one should be applying to the grip…not so. The harder you can grip (without shaking) the better. Note how little the pistol moves as it cycles. That’s not trixy recoil spring setups or a compensator…it’s a combination of the Glock 34’s inherent characteristics and applying extraordinary levels of force to the grip of that pistol. Also notice the position of Mr. Vogel’s elbows, how they’re turned slightly up. He’s actually sort of driving his elbows up to cause a pinching force between his hands. To conceptualize it, put your hands together in front of you and lock your wrists. Now raise both elbows and note how the tops of your hands are “pinched” together. If you’ve ever used the rope attachment for a tricep pulldown at the gym it’s sort of the same concept. You’re almost trying to force your hands down and apart, but because the gun is in the way all that force gets applied to the grip. 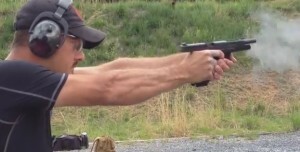 One of the big obstacles for new shooters trying to learn the grip is keeping their hands together during recoil…this pinching action, properly applied, cures that nicely. This was one of my big light-bulb moments of the course. It’s one of those things that once you see it you wonder how you didn’t think of it before, but when properly applied it makes a big difference your shooting. The location of the weak-hand grip was also covered in depth. Mr. Vogel’s general rule was to get as high up and far forward on the gun as possible. He stated that his affinity for the Glock is primarily due to the more aggressive grip he can get on the gun as opposed to other pistols he has tried. In my hands I find that I’m also able to grip higher on the Glock than on most other pistols…which is one reason why I get bitten by the slide without the Grip Force Adapter installed on the gun. 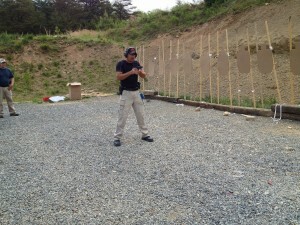 Where many instructors teach to not have any airspace between the right and left hands on the gun, Mr. Vogel’s approach is different. He doesn’t care about space between the hands as long as he can get his support hand out farther on the gun. Note that his support hand is clamping down around the farthest point forward on the trigger guard of the pistol. Mr. Vogel mentioned that in the process of acquiring this grip he occasionally neuters the function of the slide lock, but he considers that possibility a worthwhile tradeoff for the higher level of control he gets from the hand position. The extended slide lock that comes from the factory on Glock 34 and 35 pistols makes a failure to lock on empty even more likely with his grip, so he replaces them with standard slide locks from Glock. I’d also encourage you to watch the video again and pay specific attention to how he acquires his strong hand grip as he’s drawing the pistol. Most people will typically come from behind the gun or straight down on top of the gun when they’re trying to draw. Mr. Vogel comes in almost from the front of the gun, the result being the web of Mr. Vogel’s hand ends up on the lower 1/3 of the slide as he acquires his grip. From that point he tightens his strong hand down around the grip and that act pulls the web of the hand down just low enough so that the slide misses it…most of the time, anyway. As you can see from the screen capture, this is also being done with considerable force. I really noticed this when he was setting up for drills and mocks up grabbing his grip. I saw that he was almost grabbing on the back of the slide and then sort of letting the act of tightening his grip and locking his wrist drag his hand into the final position on the grip. Whether this is a conscious adaptation on his part or not I couldn’t tell you…but I found it interesting.